For those of you who love flying the friendly skies, Emirates Airlines has just the ticket for you. The Dubai-based airline made history on Tuesday, launching the longest A380 flight in the world, according to a release from Emirates. The daily service—which runs from Los Angeles International Airport (LAX) to Expo 2020 host city Dubai—lasts 16 hours 20 minutes. After the discontinuation of Singapore Airlines' 18-hour flight in November, Emirates Airlines now provides the longest flight on the planet. Hubert Frach, divisional senior vice president, commercial operations west, landed in Los Angeles aboard EK 216, Emirates’ inaugural A380 flight from Dubai. "Bringing the glamorous A380 set of wings to the City of Angels seemed like a natural fit as this aircraft mirrors the luxury of the Hollywood lifestyle," Frach said. Passengers making the historic flight will board the 489-seat A380, which includes 399 economy-class seats, 14 first-class private suites and 76 business-class beds. All passengers receive WiFi, up to 1,500 channels of on-demand widescreen entertainment and gourmet meals. First and business-class travelers receive a complimentary chauffeur-driven transportation service to and from the airport, as well as access to 35 Emirates lounges throughout its world network. Oh yeah, and they also have access to an on-board shower spa. The double-decker also offers a lounge, wines selected by sommeliers, and hors d'oeuvres and 5-star delicacies prepared by some of the world’s top chefs to the upper-deck premium passengers. 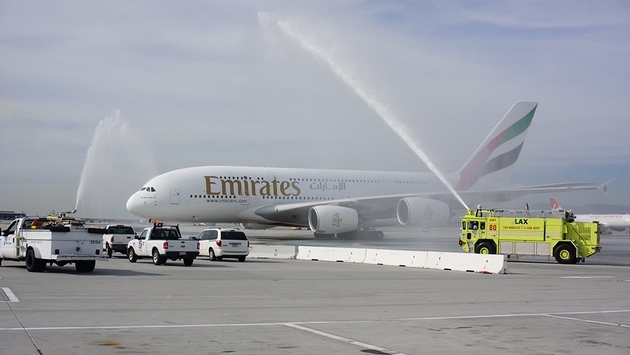 "We congratulate Emirates on the launch of its daily Airbus A380 service at LAX. 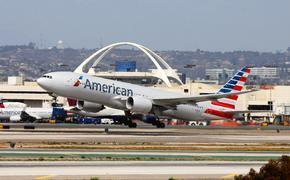 This is the type of quality air service we want to keep attracting to LAX as we continue our $4.1-billion modernization program,” said Gina Marie Lindsey, Los Angeles World Airports executive director. Emirates' EK 215 and EK 216 will run the 16-hour service. Over one million Emirates passengers have traveled between Los Angeles and Dubai, per the release. The great demand was a main reason why the historic A380 and grand service were introduced. Watch the video of the plane's journey to Los Angeles in the video below.